In many client situations we are asked "What's the best way to organize for effective innovation?" We believe this is very client-centric, and can be defined by the go to market strategy, how important innovation is as a strategic investment, the reach and breadth of the product lines and business units, and so forth. But gradually we are starting to see a more consistent organization theme, and I'd like to share it with you. 1. Senior management is enthusiastic about innovation and wants more of it, but isn't sure how to structure or fund innovation, and sometimes is even unsure what "innovation" is. 3. Ideas and initiatives need to have a home where the ideas solve a problem and can be funded. So, corporate has involvement and interest in innovation, but probably should not dictate which ideas to implement or how to organize for success. The business units or product groups have a vested interest in innovation since they can fund short term and long term profits and differentiation, but are often distracted by day to day quarterly results and don't have the resources to bring to bear. Both agree it should be done, and both have a vested interest to see it done well. 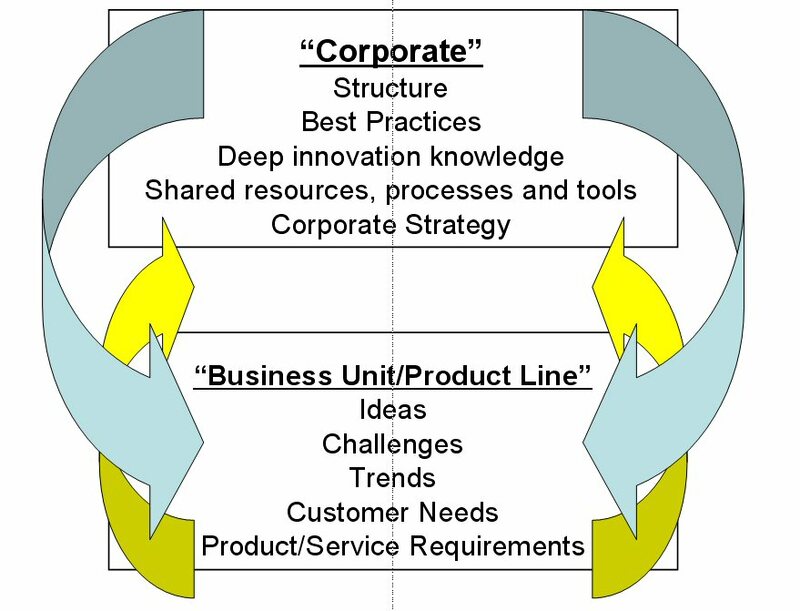 In many organizations, we are beginning to recommend a "top-down" and "bottom-up" approach, where the corporate team provides some funding, strategic intent, resources and shared tools and processes, and the business unit provides the ideas, metrics and goals. In this approach, Corporate teams can be involved in innovation without dictating which ideas are right, and business units can find additional funding and resources to help evolve an idea and start evaluation and investment. A shared model also means that as more business units or product groups take advantage of the shared resources from corporate, a more consistent language and approach can be used across the organization. 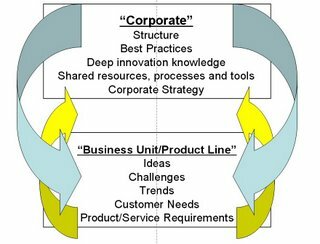 Starting with only a few resources and processes, eventually the corporate Center of Excellence may include people, processes, a database of previous ideas and experiences, knowledge of what's worked and what's failed, software tools and other capabilities to assist the business unit. Business units will benefit from leveraging skills and dollars and consistent frameworks and tools, and by gaining insight into what other business units or product groups are doing. This approach leads to more consistent innovation language, processes, tools and experience across the organization, helps ensure ideas work within the corporate structure and align to corporate strategy, provide greater visibility to ideas and increase collaboration. There are clearly other approaches - on one extreme is an incubator, in which people leave the business unit to become part of the incubator and then return to the business unit or start a new business as a result of the evolution of the idea. I think taking people out of their structure entirely breaks relationships that can be valuable and makes it hard to return to the business unit. On the other end, innovation run completely at the business unit or product group level will create a host of problems with redundancy, investment in ideas that don't align to corporate strategy, rework and inefficiency. I think in the end the shared model, with corporate providing the shared infrastructure, resources, tools and processes, and the business units providing the ideas and the people to work the ideas is probably the best approach. I've included a small graphic to begin the debate. If you have ideas about the "best" organizational approach to innovation and care to share or debate our approach, please leave me a comment. I was driving between meetings on Tuesday listening to NPR. There was a story on the new MP-3 player from Microsoft called Zune. The reporter voiced a lot of skepticism - hers and from the industry - about whether or not Microsoft would be successful with the Zune, given it's late arrival and the fact that Apple already controls much of the MP-3 market and mindshare. What struck me about this is how Microsoft has become a real "me too" player in many spaces, rather than an innovator. In many markets - game controllers and MP-3 players as just a couple of examples - Microsoft is not an innovator, and not really even a fast follower. Of course these physical devices are not Microsoft's strong suit, but they do point the way for Microsoft to control more of our spending away from the traditional PC. For any firm, there are going to be products and markets where the firm chooses to be an innovator, a fast follower or a "me too" player. These are perfectly valid strategies and should be considered as part of the business strategy. No firm, no matter how smart or strong, can differentiate only on innovation. Frankly, it would wear out the people inside the organization. Google's probably the closest example of a firm focused completely on innovation - but their real goal is dominance in the online ad space. Google will create or acquire anything that provides more opportunity for presenting data (and adds) online. Every firm must consider its market and competitors and its own products and services and make determinations about which products or services it will position as innovative, and where it may make more sense to be a fast follower. The "me too" plays are often older products or services or areas where the firm believes it needs a presence but recognizes that for now it cannot be a dominant player. Being the innovator can be rewarding but very tough. Often as an innovator your firm or team will break new ground and needs to expect some big successes along with some not so great failures. Fast followers, on the other hand, will never lead the market but try to quickly adapt to and copy successes in new markets, driving down the cost and adding other choices and options. What struck me about the Zune is what a "me too" addition to the MP-3 world it really is. There aren't many new or innovative options the Zune offers over existing MP-3 players or the iPod. If you consider that MP-3 players have been around for five or six years, and the iPod phenomenon for over 3 years, this is a late "me too" offering by Microsoft, recognizing that it needs to play in this space and gain a better understanding of the hardware and the services wrapped around the MP-3 player. In this case, this is probably a good but fairly risk averse strategy. 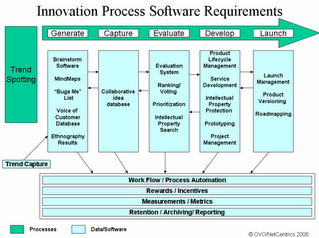 As you examine your business, in which areas or products is your firm "innovative"? In which are you a "fast follower"? Is that strategy by design or accidental?